This October, Charles Soule and Phil Noto will kick off Matt Murdock’s darkest chapter yet – one which will lead to a chilling and surprising finale in November’s DAREDEVIL #612 that no reader will want to miss! Charles Soule’s Daredevil run is ending with #612. 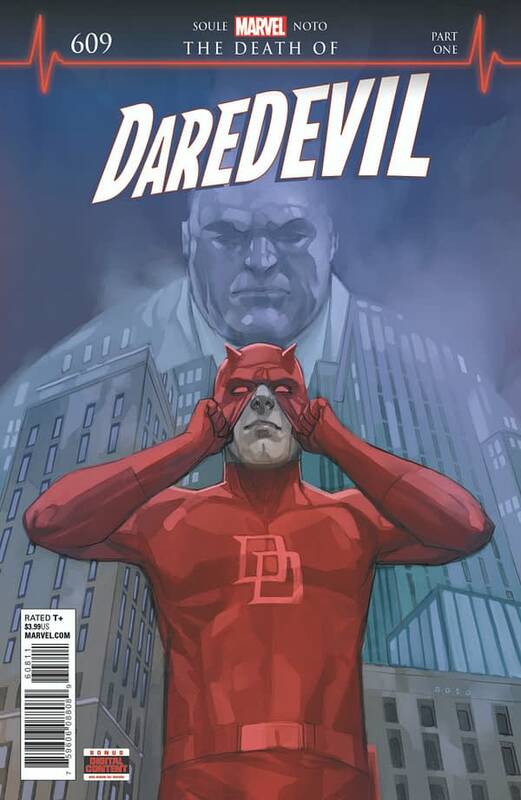 Daredevil will be featured in the upcoming Marvel Knights revival mini-series, in which he has forgotten who he is. There is no Daredevil comic in December’s solicitations. Could the “death” be a figurative one, and a new Daredevil series (with a shiny new #1 issue) launching out of Marvel Knights next year? Perhaps we’ll learn more at New York Comic-Con.